This year's 2012 — The Musical is more engaging than previous Mime Troupe productions, but it still relies on the old formula. Michael Gene Suållivan as President Obama. The best part of last Saturday's San Francisco Mime Troupe performance — held at Frances Willard/Ho Chi Minh Park in Berkeley — happened when a lop-eared rabbit, which apparently belonged to someone in the audience, sprang loose and tore right up to the foot of the stage. Within seconds a small dachshund was in hot pursuit, followed by the rabbit's owner. The three of them wended through a large crowd of spectators, stepping on blankets, dodging backpacks, and nearly crushing a picnic lunch. The rabbit owner managed to catch her pet just in the nick of time. The dog trotted back to its seat and pooped. In a way, it seemed apropos of a production that's all about the triumph of the little guy. A fast rabbit can evade a potbellied dog in nature, just as a clever workingman can outfox a greedy capitalist in the fantasy world of the San Francisco Mime Troupe. This year's play, 2012 — The Musical, has all the usual tropes: evil bankers ("banksters," in Mime Troupe patois), political caricatures, song and dance numbers, sloganeering, Faustian bargains, wolves in sheep's clothing, and, as always, a narrow victory for collectivized labor. Plus, it's topical. While recent Mime Troupe plays have covered everything from the banking crisis to red state-blue state balkanization, 2012 looks at the fate of political art in a market economy. Specifically, it's about the intersection of art and corporate interests. The drama centers on a small political acting company, Theater BAM!, which accepts a handsome commission from Green Planet, Incorporated. Corporate sponsorship is, of course, a dicey proposition for actors whose favorite credos are "power to the people" and "the revolution will not be downloaded." But it's a necessary evil when one of them has kids to feed and another slings lattes to pay the rent. Not to mention that a land developer wants to demolish their theater to make way for a new parking lot. BAM! 's financial quandary accurately reflects that of many artists in the real world. And it's set against a backdrop of a national economic crisis, as depicted in the play's prologue — actually a play within a play. One of the BAM! 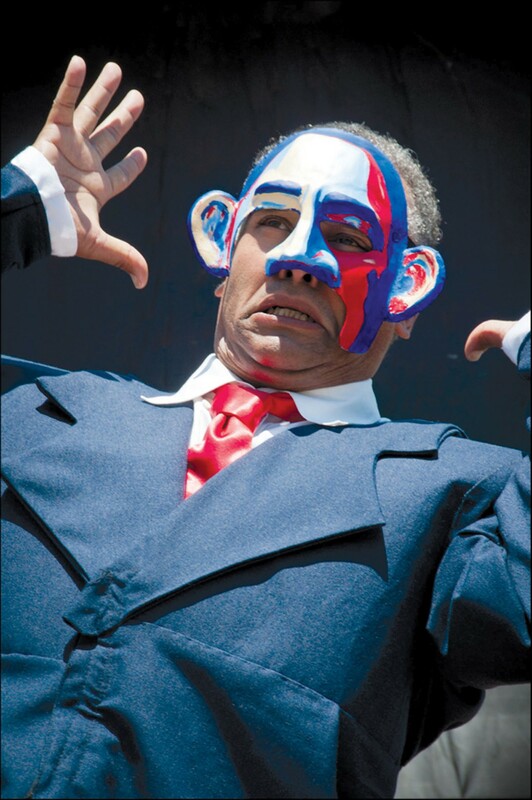 actors dons a mask to play President Obama, who falls into the clutches of several banksters — all dressed as Seventies pimps, one with a set of balls hanging from his chin. Evidently, that's the kind of political satire that BAM! is known for. It's only slightly campier than a real Mime Troupe production. Written by Michael Gene Sullivan and directed by Wilma Bonet, 2012 is more timely than last year's Posibilidad (about workers taking over a factory) and more entertaining than 2009's Too Big to Fail (about the banking crisis). A lot of that has to do with the acting. Sullivan, who handles about six roles, is a consummate performer. He can sing, dance, flit nimbly about the stage, portray a sleazy politician or a frustrated actor, and pretty much carry an entire Mime Troup play by himself, if need be. Fortunately, he's accompanied by a several equally talented actors this time around, including Victor Toman (who plays five characters), Cory Censoprano (six characters), and Keiko Shimosato Carreiro (who plays BAM! 's main corporate benefactor, Ms. Haverlock). Even better than the performers themselves is the script, which has an unusual degree of self-irony. For once, the Mime Troupe manages to make fun of itself by portraying a similarly earnest, similarly beleaguered group of actors. There are barbs against eco-consciousness, as indicated by the very name "Green Planet, Incorporated." (The company purports to be meat-free, wheat-free, dairy-free, free of harmful chemicals, and adamantly pro-compost.) There's even open acknowledgement of how difficult it is to be entirely purged of corporate interests. At one point during Saturday's performance, an actor turned to address the audience: "How many of you work for corporations?" he asked. Of the two hundred or so people assembled, only three hands went up. Someone had to be lying. The truth is that we can't all be purists. Moreover, we can't all adhere to the Mime Troupe format of staging plays in parks, and passing a hat for donations. The Troupe survives in large part because it relies on a tried-and-true formula. The performances all clock in at a taut ninety minutes, and they're all undergirded by live jazz music from the Mime Troupe House Band (drummer Neil Wadhawan, keyboardist James Anthony Mitchell, and multi-instrumentalist Michael Bello). The jokes seem current, but the themes are extremely recognizable — not for nothing did one wag refer to it, on Twitter, as "The SF Mime Trope." And with all that said, it still comes with an admirable political message: In a world of dogs, a bunny can still win.